One of an influential breed of chef-restaurateurs in America, Wolfgang Puck is credited with reviving California’s culinary heritage. Blending fresh California ingredients and classical French training, his innovations in cooking have been enjoyed and praised by world leaders, Hollywood stars and fellow chefs alike. The Austrian-born Wolfgang began his formal training at age 14. After an apprenticeship at L’Oustau de Baumaniere in Provence, he developed his creativity at several three-star French restaurants, including the Hotel de Paris in Monaco and Maxim’s in Paris. Wolfgang came to the United States in 1973, and soon became the star attraction at Los Angeles’ Ma Maison, both as chef and part-owner. He then left French cuisine to establish Spago Hollywood on the Sunset Strip. Spago Hollywood’s casual chic interior and trend-setting open kitchen, designed by partner Barbara Lazaroff, coupled with his trademark gourmet pizzas, enhanced his popularity with the glamorous Hollywood crowd. Spago Hollywood earned many awards, including the prestigious James Beard Restaurant of the Year Award in 1994, before closing in 2001. Barbara and Wolfgang followed up their Hollywood success with Spago Beverly Hills, Spago Chicago, Spago Las Vegas and Spago Palo Alto. Aside from their Spago empire, Wolfgang and Barbara have opened numerous other restaurants. The internationally acclaimed Chinois on Main in Santa Monica, CA, features imaginative Asian-inspired cuisine and exotic decor. Wolfgang’s Postrio Restaurant, opened in 1989, is located in San Francisco’s Prescott Hotel and reflects the city’s Italian and Asian communities. Granita, opened in 1991 in Malibu, CA, was inspired by Mediterranean colors and flavors. Vegas ventures include a second Postrio in The Venetian Hotel and Trattoria del Lupo, located at the Mandalay Bay Resort. In 1993, Wolfgang and Barbara entered the casual dining arena with a series of whimsical Wolfgang Puck Cafes. Through the Wolfgang Puck Food Company, Wolfgang markets a frozen version of his famous California style pizzas, as well as a variety of pastas, canned soups and other gourmet specialties. Wolfgang’s cookbooks include Modern French Cooking for the American Kitchen (Houghton Mifflin, 1981), The Wolfgang Puck Cookbook (Random House, 1986), Adventures in the Kitchen with Wolfgang Puck (Random House, 1991), Pizza, Pasta and More! (Random House, 2000), and Live, Love, Eat (Random House, 2002). In 1994, Wolfgang and Barbara were recipients of the James Beard Foundation Humanitarian of the Year award. In 1998, Wolfgang received the James Beard Foundation Award for Outstanding Chef. Wolfgang lives in Los Angeles and has two sons, Cameron and Byron. Do you want to hire Wolfgang Puck? Directly request a quote. In 48 hours we can send you the availability of Wolfgang Puck If you would like to book Wolfgang Puck, Entertainment Booking Agency is the right place. We will offer you the best price and contact the management or we directly contact Wolfgang Puck. For corporate appearances or speaking engagements you can contact our agents and the will help you true the process. 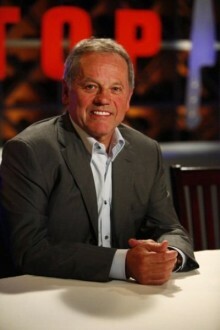 Tags: hire Wolfgang Puck, Wolfgang Puck booking, book Wolfgang Puck, Wolfgang Puck appearances, find more information on booking Wolfgang Puck for appearances, Wolfgang Puck speaking engagements, Wolfgang Puck endorsements/spokesperson, Wolfgang Puck appearance fees, Wolfgang Puck booking agency contact info, biography of Wolfgang Puck, Contact an artist booking talent agent find a speakers bureau that can book Wolfgang Puck, speaker booking agency for Wolfgang Puck, Wolfgang Puck booking agency, Wolfgang Puck booking for corporate event. EBA is one of the biggest entertainment booking agencies in the World. We book hundreds of celebrities, artist, athletes and speakers in a year. Important to know is that we are not claiming to be the management of Wolfgang Puck. We are not the official agent for Wolfgang Puck. Companies from around the globe book these artists and speakers true our company be course we have one of the biggest networks and we always have direct contact with the artist or the management. We help you to find the right celebrities for your corporate of private events. Please contact one of our agents to get free advice and we will help to get the world-famous artist on your party.